Alex Chitty. 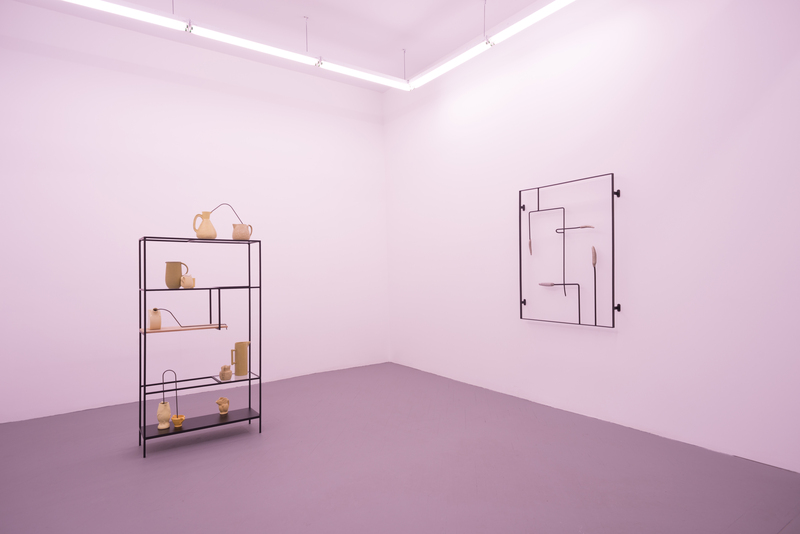 Installation view of “the sun-drenched neutral that goes with everything” at PATRON Gallery, 2016. Several of the works in “the sun-drenched neutral that goes with everything” are part of a sculptural series of the same name. In the series, Chitty has taken shelving units and removed most of their functionality, stripping the pieces down to their frames and adding an array of objects within them. Upon entering the gallery, visitors encounter “unit 1,” an L-shaped steel structure whose remaining shelves help to frame the spare items arranged on them. The individual shelves frame each scene as its own display, while the unit as a whole exists as a total sculpture. Many materials that the artist has worked with before make appearances, such as hanging horse hair and small wood and brass figurines, but it is some of these details that are the most interesting aspects of the show. In “unit 3,” a huarache is placed under one of the legs of a desk, adding a bit of playfulness to an otherwise serious-looking sculpture. Alex Chitty. “Wet of Wing,” 2015-2016. A smaller exhibition space behind the main gallery is cast in a pink light, reminiscent of Rihanna’s “Work” video. The hue calls to mind the sun-drenched nature of the show. “Unit 5,” which is displayed here, is already the most lively of the series, featuring orange- and yellow-toned ceramic pieces. They contrast greatly with the neutral objects in the rest of the exhibit. 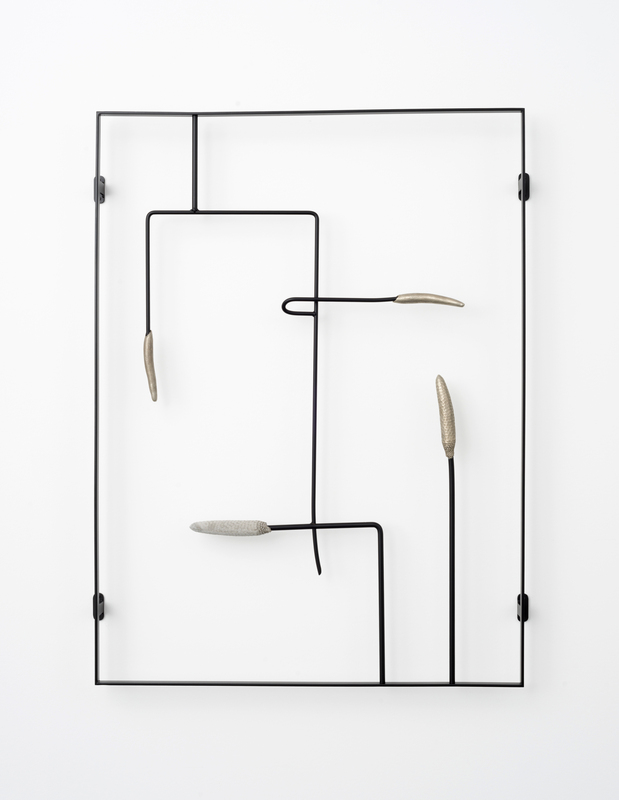 Also exhibited are “Sparrow is a bird” and “Wet of wing,” two wall-mounted sculptural works made of powder-coated steel, bronze and cement. The nature-inspired pieces recall some of Chitty’s earlier work, such as “Willet” and “30 second sparrow;” here they fall a little flat. The Miami native’s warm roots show through in a few places, from the aforementioned sandal to a broken skateboard deck to the photo titled “Everything is the same, except for that one thing.” Directly to the left of the entrance, the inkjet print depicts a stack of spent orange halves leaning against a glass wall. Several bees are descending upon the fruit, captured mid-flight. The SAIC alum is at her best in such works, which bring color and life to what can otherwise be a sterile white box. Through March 5 at Patron Gallery, 673 North Milwaukee.